Delaware combines for a gang tackle in its game Saturday against James Madison. HARRISONBURG, Va. — Delaware failed to mount much offense in its 20-6 loss to James Madison in the first round of the FCS playoffs on Saturday in Harrisonburg, VA. The Blue Hens’ season ended on a three-game losing streak. Delaware’s average starting field position in the first half was their own 19-yard line, while James Madison began its drives at its own 44-yard line on average. 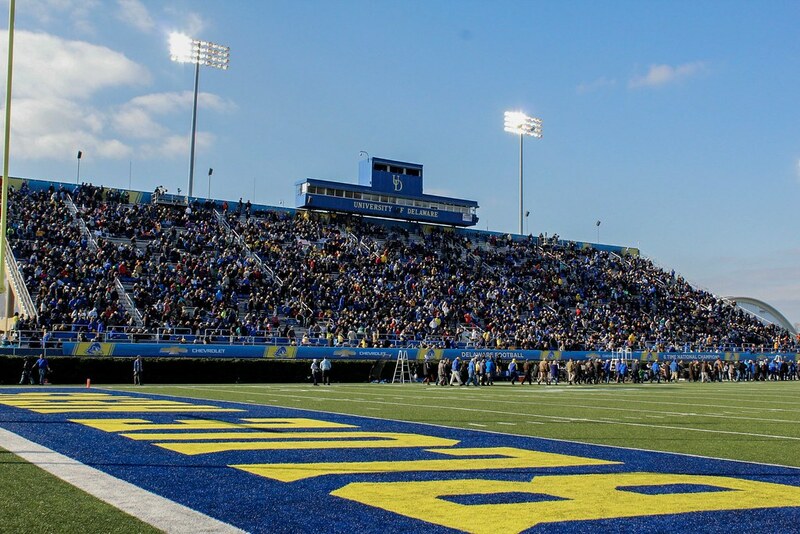 Once backed up inside their own 20 (and twice inside their own 10 on consecutive drives at the end of the first quarter and the beginning of the second quarter) the Blue Hens’ offense was a shell of itself, forced into conservative play-calling given its immobile passer and less-than-stellar field position. Rather than take chances down the field, Delaware tried to avoid turnovers and easy opportunities for James Madison. Starting from their own seven-yard line with 12:02 left in the first half, Delaware called two runs, which didn’t gain anything, and then dropped quarterback Pat Kehoe back into its own end zone where he was sacked for a safety by James Madison defensive lineman John Daka. The play almost ended in a nine-point swing, as the Dukes, following the safety, marched to the Delaware one-yard line, but were stopped short on a Ben DiNucci quarterback sneak on fourth and goal. But after the failed attempt, Delaware started its next drive at the one-yard line and once again, playing it close to the vest and went three-and-out. Delaware’s six first half three-and-outs were at the root of James Madison’s excellent starting field position, which they turned into a 12-3 halftime lead. Kehoe completed 13 of his 32 pass attempts for 116 yards. At the end of the first half he was 2-9 for 35 yards. He also threw two interceptions. Since Delaware’s 40-36 victory against Towson on Oct. 27, in which Kehoe threw for a career-high 305 yards, the team averaged 150 passing yards per game. Delaware’s yards-per-completion, which at the beginning of the season was among the best in the CAA, dropped to 8.9 against James Madison and 10.9 over the last four games. Of course, Kehoe did not play most of the Villanova game, leaving in the first quarter with concussion symptoms (he was relieved by redshirt freshman Nolan Henderson and redshirt senior J.P. Caruso), and was limited in practice throughout the week. But the passing offense over the final few games of the season, led by a Kehoe who didn’t quite look like himself, simply wasn’t enough to be a playoff contender. Delaware’s 150-yard average over the final four games would place the team last in the CAA in passing had it been their season-long average. Heading into the James Madison game, Delaware was eighth in the CAA with a season average of 202.3 passing yards per game. In this game and in most of their contests this season, the Blue Hens failed to establish the run. Delaware’s per-carry average of three yards entering Saturday was well below its average of just over four in 2017 and just above five in 2018. The story was no different in Harrisonburg. Dejoun Lee got the first go at running back with Kani Kane still managing a knee injury. Lee carried 12 times for 27 yards (2.2 yards per carry). Penn State transfer Andre Robinson received six carries and gained 29 yards, mostly in long down-and-distance situations. The lone bright spot in Delaware’s rushing attack was a 38-yard pickup by Joe Walker on a reverse handoff. Early in the game, James Madison brought one of their safeties down into the box to guard against the run, with the other safety often shaded in the direction of Walker. Once the Blue Hens fell behind by two scores in the second half, they were forced to abandon the run. 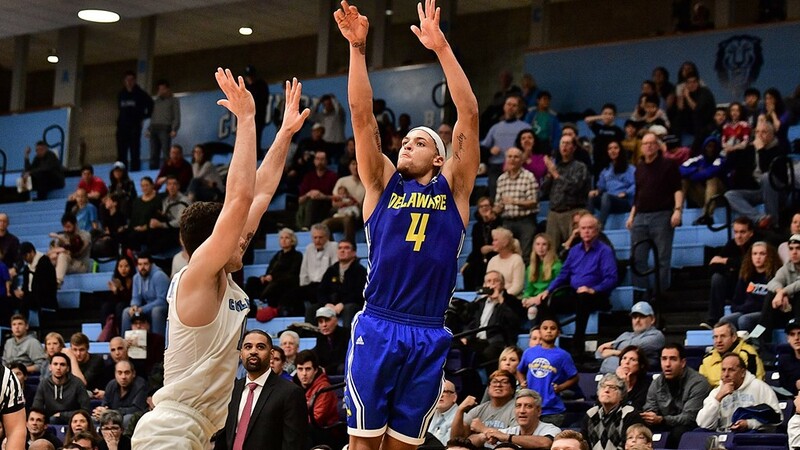 Delaware’s defense rebounded from its poor showing against Villanova. Delaware held James Madison well below its 36.5 points per game average and limited the Dukes to about 100 less total yards than it had averaged over the 11-game season. For the second consecutive season, the Delaware defense kept things interesting, but the offense didn’t do nearly enough. (James Madison defeated Delaware 20-10 in Newark in 2017). Linebacker Troy Reeder, in his final game as a Blue Hen, tallied a career-high 16 tackles. Two other Blue Hens reached double figures in tackles, defensive lineman Caleb Ashworth (11) and linebacker Charles Bell (10), and safety Nasir Adderley, who James Madison Head Coach Mike Houston credited with slowing down his team’s ground attack, added seven tackles. 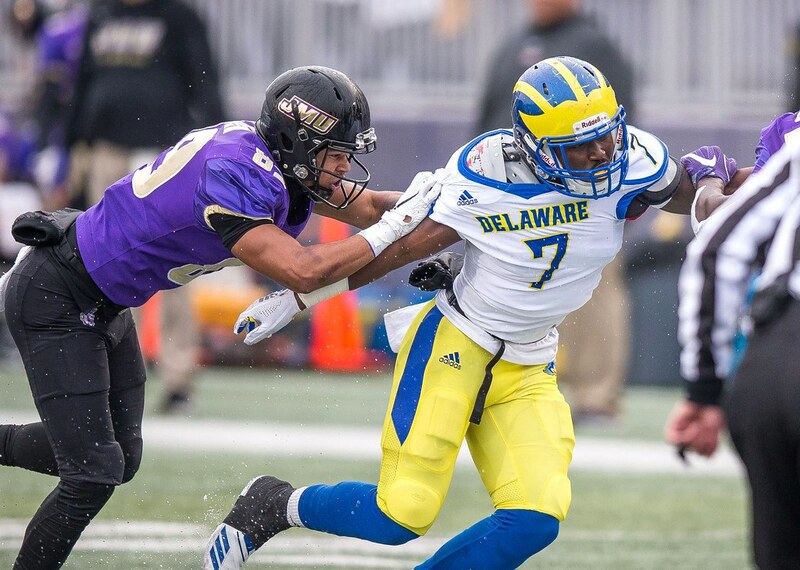 After DiNucci found wide receiver Jake Brown for an eight-yard touchdown to cap off a 13-play 75-yard drive with 4:09 remaining in the third quarter, the defense made four stops to keep Delaware’s deficit at 14. The Dukes may not be as talented as they were in the past two seasons, but James Madison is one of the best teams in the country. For the first time in three seasons James Madison did not win the CAA title. It went to a 7-1 Maine team, that because of the CAA’s 12-team structure, did not have to face Delaware or James Madison. Despite being ranked No. 6 in the latest STATS FCS Top 25 poll, James Madison was not awarded one of the top eight seeds (which come along with a first-round bye). But the Dukes looked like a top-eight team Saturday. When the running game stalled, James Madison leaned on its quarterback, DiNucci. He led a decisive 13-play 75-yard drive with a steady dose of hitch routes and run-pass options that put the Dukes ahead by 14. When he wasn’t getting the ball out quickly, he made moves to extend plays with his legs. The best teams in the nation can move the ball in multiple ways. It’s a unit that put 73 points on Robert Morris (by scoring on 11 of its first 12 drives), 63 points on Richmond and blanked William and Mary 51-0. James Madison may lack the firepower that they’ve had in recent seasons, but it’s still a complete team with solid players all over — the mark of a well-established and well-coached program. Jared Ambrose, who spent the past 10 seasons at Towson and previously was an assistant at Delaware, will be the Blue Hens' next offensive coordinator. Delaware men's basketball is now 7-2 and tied for first in the CAA. Delaware reached the postseason for the first time since 2010.